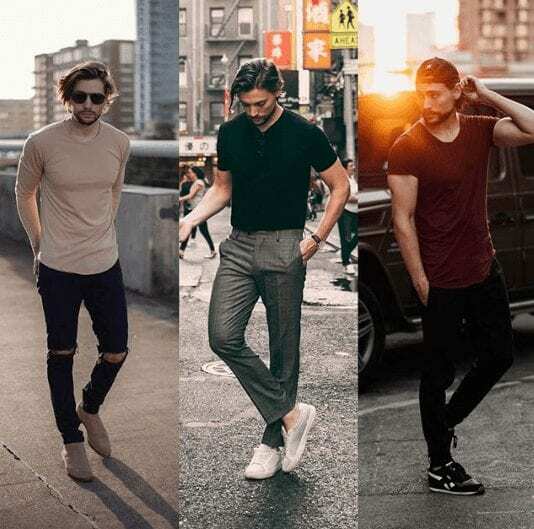 Popular Casual Outfits for Men – There are numerous lists and top fashion tips available for girls of all ages throughout the internet so we thought why not satisfy this longing among men also. For all those men who have been looking for casual outfit ideas, today we will guide you with it. Most men like to keep their dress code casual, because it is one of the most comfortable dress codes, providing an instant relaxed style. Other than comfort, casual outfits also offer practicality and a “being cool” sense if styled properly. By a little styling, you can always enhance your dressing style. 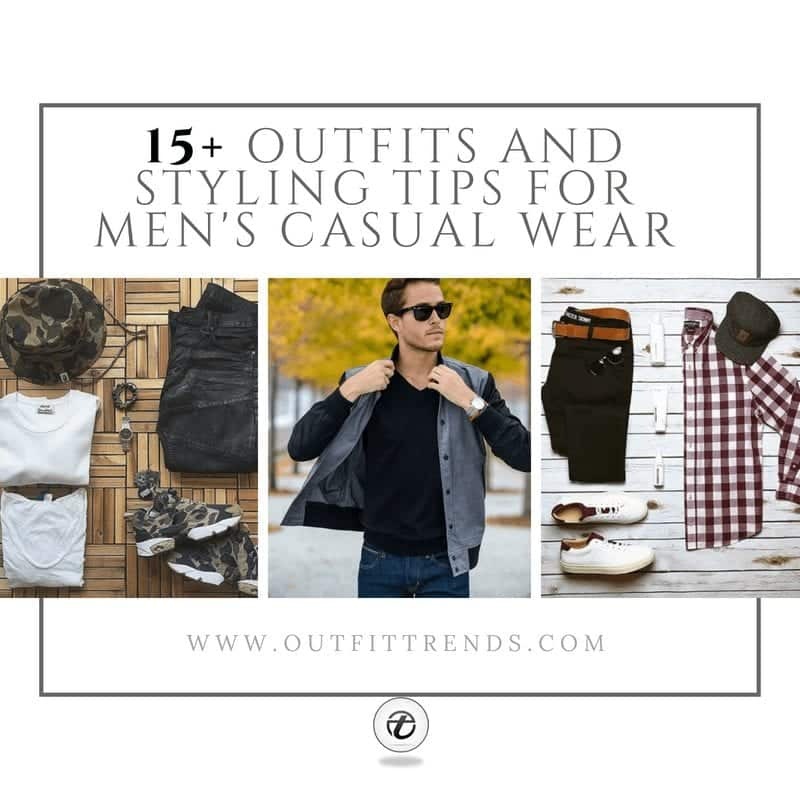 So here we are, to show you some amazing casual dress ideas for men for this season. Most men have a couple of jeans and shirts in their wardrobe. Very few like to add formal clothes to their closet. If you don’t own some cool T-shirts you are definitely lacking behind in the fashion sense. To be well dressed, you need to own a few pairs of jeans and shirts that are very casual and stylish. For sharp but casual dressing, your ‘fit’ is the most important aspect. When buying your casual outfits, pay special attention to the material and fabrics used. When in doubt, opt for classic styles. For a more mature look, choose solid colored or striped shirts instead of the regular graphic tees. Add colors to your wardrobe through chinos, instead of wearing the good old jeans all the time. Go for classy and comfortable footwear. Accessorize your wrists to amp up your style game. In Fall and Winters, choose good layering techniques to make the most of your outfit items. Lastly but most importantly, keep it all simple. Here are three very different yet sharp casual looks that have incorporated our favorite color, black! For more ideas, check out these 29 Ideas How To Style Black Pants. Here’s a list of must-have accessories for men. For the Summer season, a good pair of Sunglasses is definitely something worth investing in. We suggest that you go for Ray Bans or Ditto sunglasses but you need to experiment by yourself to find the perfect sunglasses that go with your face shape and make you feel good. Other than that, a good-looking watch will always help upgrade your style. Look for a unique watch that represents your style and one that can be a conversation starter. For summers, you can opt for lightweight watches in classic designs. If you travel a lot, you might want to buy a belt key-holder. And even if you aren’t traveling, if you carry a couple of keys with you, why not carry them in a stylish way? There are a number of different options here as well, for a more biker guy look, you could opt for ones with more metal and chains. And for a more sophisticated look, go for leather ones such as the Carhartt WIP Patel Keyholder or the Maxpedition Gear Keyper that you can buy on Amazon for as low as 10USD. There are also other options that come with bottle hooks and even USBs so feel free to explore this amazing accessory. If you like wearing jewelry, you could go for metallic rings or beaded bracelets. The key here is to keep things minimal and make sure that they go well togetehr instead of clashing with each other. For Winters, this year is all about bomber jackets and scarves. They can help create casual looks with modern vibes so we highly recommended men and boys of all age groups to give them a shot. We all have a pair of denim jeans that we love the most because of its perfect fit and the comfort it offers. This level of comfort is usually only offered by your oldest denim, the ones that have pretty much grown with you and no new jeans can ever replace them. So here are three different casual looks to try with your go-to denim jeans for this Fall season. Even if you have a single one of each of these in your closet, you can mix and match them up to create hundreds of different looks. For instance, a nice quality blazer would look equally good when worn over a t-shirt or a button down shirt. Jeans with V Neck Shirt: Boys/men mostly prefer clothes in monochromatic tones and this styling idea is another go at the same tone. White has always been a favorite among men but to make it a little more stylish, wear it in v-neck fashion with regular patched denim and grey ankle-high boots. It’s always good to have a mix of dark and light shades in your wardrobe. You can pair any kind of outfit with your denim jeans so always buy the best quality ones. Roll over your trouser for the extra cool look. Beanies and T-shirts: Purchase some T-shirts of different styles and colors. You can find some interesting designs in the shops and online too. Replace them with your old typical branded shirts. Graphic shirts are not just trending these days but they also make good everyday outfits. You can invest in some beanies for the winter season, preferably a dark toned one and pair it up beautifully with your regular jeans. Facial hair can add the extra dapper look. Collared shirts: A student looking for college outfits or just going out on a lunch date? Both occasions call for a little formal attire but luckily, formal has now merged with casual and who doesn’t like to wear collared shirts? They are the most stylish shirts you can wear casually. Whether you wear it with jeans or pants. Try to come out of the old designs and colors, rather go for new patterns and styles. Jazz up a simple collared shirt with suede oxfords and rolled up skinnies. Polo shirts with Bermuda Shorts: The words “summers” and “well-dressed” instantly bring Polo shirts to my mind. We have already shared some great ideas on how to wear polo shirts for a sharp look. They are very casual and useful for all the men in every kind of weather. Go for dark and bright colors, as they enhance the boldness of your outfit. Pair your polo shirts with Beige Bermudas for a day out with friends at the beach. You can wear plimsols or just open sandals. Cardigans: The most stylish casual outfit that can be worn on chilly days, has to be a cardigan. They come in different designs and colors. From front open to buttoned cardigans. They are way too classy and you can easily wear them with denim jeans. It’s best to wear them in winters as they keep you warm. Adam Gallagher shows us how to style cardigans with jeans for a perfect casual look. Always go for a preppy hairstyle with your cardigans for the best look. I hope that by now you have made up your mind about what outfits and clothes you need to get in your wardrobe this season. Updating your closet once in a year is a must. Look around for new designs and styles when you visit shopping malls or see what top celebrities are wearing. The more knowledge you gain about fashion, the more stylish outfits you would opt to wear. A well-dressed man will gain a lot of attention and will also be more attentive about his appearance, which is definitely a plus point. But most importantly, when you look good, you feel good about yourself and everything seems to fall into place all by itself. If you are a suit lover, then going business casual is the best way to carry your style. These days, suits can be worn as casual wear also. You can dress up for summer weddings or for your dates or just Christmas and holiday parties. Suits will take you anywhere just remember to wear according to the fashion for casual wear. Wear pinstriped shoes with a dotted tie and colorful socks or hats and a little-exaggerated hairstyle. You can also choose to wear your suits with trainers or sneakers for the ideal smart-casual look. A little risk-taking are you? Then go for this super trendy style for men with a long coat and a little high rolled up jeans with socks and sneakers for a winter look. Is adventure in your nature? Like to climb, hike or camp? Whatever is your passion, this casual attire is perfect for the outgoing man. A hoodie, sleeveless jacket and a flannel plaid shirt with denim and construction boots. A backpack and a beanie is a must item in your Winter attire. Here’s another casual Winter outfit with a sweater. Add a touch of plaid or flannel to your Spring outfits this year. You can use these shirts for layering or just to tie around your waist for some extra style points. Have a look at these 25 Ideas How to Tie Shirt Around Waist for Guys. Cool, casual and classy – you don’t need anymore words for this look! Parachute army jacket is a perfect combo for the spring casual dressing. The perfect casual hairstyle would be one that is low-maintenance, acceptable at work-places and of course great looking. If you want a clean-cut style, you can opt for the IVY-league hairstyle. For a more trendy look, you can go for combed over hairstyles. If you’re a teenager of in your early twenties, the faded and undercut hairstyles are always worth a try. You casual shoes will include sneakers, sandals, flip-flops, and loafers. You can also choose to wear shoes like the boat shoes without socks for a laid-back look this year. One of the most trending colors for guys this year has been mustard. It looks particularly good when chosen as bottoms like jeans or chinos and there are so many ways to style it. The mustard bottoms make a really good base color for you to play around with so here are some of our favorite looks to inspire you. Really cool idea. But polo t-shirts with Bermuda!! sounds look really cool. better than my blog. What brand is that black polo shirt with the shorts? Informative fashion tips for men. I love to wear v-neck tees with jeans, it really looks cool and stylish. These tips are very helpful and it will works.Thanks!! hi.there.i want to ask i have a mustard jeans.what kind of sweater or t-shirt should i wear. What brand is the brow leather jacket with the epaulettes under the spring casual style heading? You Look cool in casual. I love the t-shirts. Which brand you follow for tees? i really like the Ideas you share, i like the casuals combination of dresses. i like that combination of 11th idea “casual essential for men”. you are working very well. some of the picture are little fade. i think you have to improve this. well you choose fabulous color combination.